Breathing during freestyle is a funny thing. When you are good at it, it’s hard to articulate exactly why it works—it just does. When you’re not, it’s all you think about, and it makes swimming mind-numbingly difficult to boot. Consider this: within one cycle of freestyle, a swimmer is required to precisely complete upward of 15 distinct movements within the span of two strokes. As good as most athletes are at multitasking, that’s still a very complex series of movements within a very short period of time. This complexity of movement can lead to a lot of different kinds of problems with the way a swimmer breathes and swims. 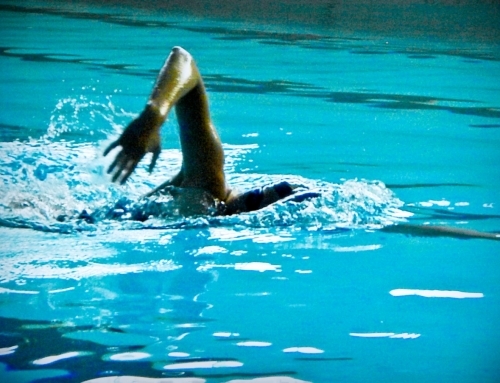 One of the most common problems involves swimmers who breathe by rolling onto their side. In the swimming world, this is known as an “over-rotated” or “unbalanced” breath. Over-rotating during the breath has one colossal hitch: The human body is just not built to be able to float in this position. The next time you go to the pool, try this little experiment to see why: Float on your side with your head in a breathing position. Most likely, this will cause you to sink very quickly, just as you would if you over-rotated during your breath. This makes it much more difficult to consistently use good technique as you swim. Fixing this problem requires understanding a little bit about the way body rotation should work when swimming freestyle. 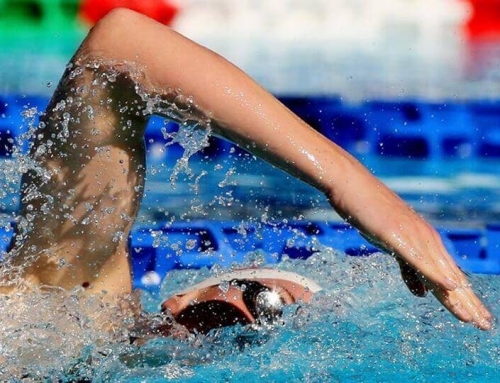 In the swimming world, freestyle is known as a “long axis” stroke, meaning that a swimmer’s body rotates from side to side along the line of their spine as their arms stroke through the water. Typically, most swimmers rotate somewhere between 20 to 45 degrees relative to the surface. There is also a general rule of thumb that says that if a swimmer rotates more than 45 degrees, they will sink. Maintaining balance during the breath is all about consistency. Ideally, your rotation during breathing and non-breathing strokes should be exactly the same. This makes it easier for you to keep your body balanced in the water. This will help you reduce your stroke count, leading to more efficient (and usually faster) swims. To be able to do this requires that you do two things: 1. 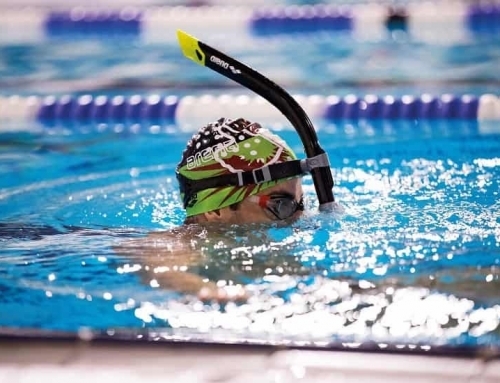 You need to initiate the breathing movement early in the stroke, and 2. 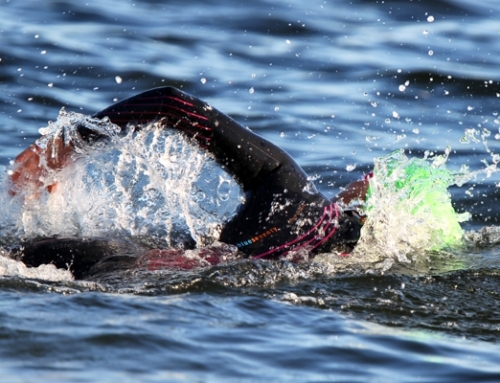 You need to ensure that your body never rotates past 45 degrees in the water. Tummy drill was designed to do two things: 1. It allows a swimmer to “feel” what an earlier breath initiation feels like, and 2. It makes it very difficult to over-rotate during the breath. Both of these things make it the perfect drill to use when working on a balanced breath. Tummy drill might just be one of the easiest drills you ever learn. Start in “Superman” position with both of your arms extended in front of you. Keep one arm in that position and move your stroking hand to your stomach. Leave it in place as you move your head up to breathe. Once you do, finish the stroking movement of that arm and begin your stroke with your other arm. When doing this drill, it’s a good idea to take an even number of strokes between breaths so that you can keep the movement as consistent as possible. The fact of the matter is, no matter how hard you try, you can’t swim freestyle unless you breathe properly, and breathing properly in freestyle is hard. If you spend some time learning how to stay balanced in your breath, you will be well along your way toward optimizing your breath in such a way that you will be able to swim faster on race day. Need to make it easier? Try the same pattern of breath while standing on the bottom and holding the gutter. 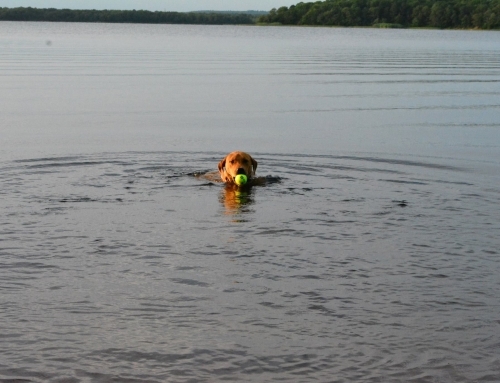 Repeat a pattern to yourself in your head as you swim, such as “Tummy, Breathe, 1, 2, 3, 4). It will make it easier to make sure that you complete each movement. Don’t rush! If you swim slower, it’ll be easier to do the drill. I don’t know about you, but I don’t carry a protractor with me into the pool, and even if I did, I have no idea how I would measure my rotation as I swim. Luckily, It’s not as important for me to know exactly how much I rotate as it is to know that I don’t rotate to far, and “tummy drill” is a great drill to use that provides that exact information.